The unexpected arrival in 1853 of a squadron of heavily armed black navel ships into the bay of the Shogun’s capital, Edo (now Tokyo), sent shock waves through Japanese society. Commodore Perry, the head of the US navel force, presented demands for Japan to open its ports to the outside world. Feeling impotent in the face of superior western technology and military power, competing feudal military domains quickly took sides and fought over which strategy to take to defeat the foreign menace. Japan had long lingered in isolation, united under a system of Samurai dominated domains held together by military might, with a central Shougunate power in Edo (now Tokyo). At the same time people also gave allegiance to the Emperor in Kyoto. From amongst the turmoil and infighting, Katsu Kaishu emerged as a decisive leader. His worldview, foresight, support of certain leaders, such as Sakamoto Ryoma, diplomacy and his political astuteness, helped Japan emerge from feudalism into unified modern state. It was a truly miraculous transformation. Almost overnight feudalism had ended. Gone too were social classes, including the dominate Samurai military class. Centuries of competing Samurai fiefdoms had been replaced, and people saw themselves as part of a larger entity, Japan as a nation. Japan too avoided the fate of so many other Asian countries, such as China and India, which had become subjugated and turned into European economic enclaves. Katsu Kaishu, “consummate samurai, streetwise denizen of Downtown Edo, founder of the Japanese navy, statesman par excellence and always the outsider, historian and prolific writer, faithful retainer of the Tokugawa Shogun and mentor of men who would overthrow him,” was among the most remarkable of the numerous heroes of the Meiji Restoration. Ryoma was an outlaw and leader of a band of young rebels. Kaishu was the commissioner of the shogun’s navy, who took the young rebels under his wing at his private naval academy in Kobe, teaching them the naval sciences and maritime skills required to build a modern navy. Kaishu also imparted to Ryoma his extensive knowledge of the Western world, including American democracy, the Bill of Rights, and the workings of the joint stock corporation. Kaishu was one of the most enlightened men of his time, not only in Japan but in the world. The American educator E. Warren Clark, a great admirer of Kaishu who knew him personally, called Kaishu “the Bismark of Japan,” for his role in unifying the Japanese nation in the dangerous aftermath of the fall of the Tokugawa. Shogunate, was born in Edo in January 1823, the only son of an impoverished petty samurai. The Tokugawa had ruled Japan peacefully for over two centuries. To ensure their supremacy over some 260 feudal domains, the Tokugawa had strictly enforced a policy of national isolation since 1635. But the end of the halcyon era was fast approaching, as the social, political and economic structures of the outside world were undergoing major changes. The nineteenth century heralded the age of European and North American capitalism, and with it rapid developments in science, industry and technology. 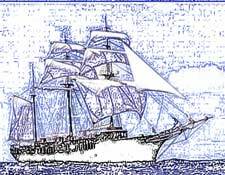 The development of the steamship in the early part of the century served the expansionist purposes of the Western powers. Colonization of Asian countries by European powers surged. In 1818 Great Britain subjugated much of India. Through the Treaty of Nanking, which ended the first Opium War in 1842, the British acquired Hong Kong. The Western encroachment reached Japan in 1853,when Commodore Matthew Perry of the United States Navy led a squadron of heavily armed warships into the bay off the shogun’s capital, forcing an end to Japanese isolation and inciting fifteen years of bloody turmoil across the island nation. Until Perry’s arrival, pursuers of foreign knowledge existed outside the mainstream of Japanese society. Kaishu was an outsider, both by nature and circumstance. But when his sword master urged him to discontinue fencing to devote himself to the study of Dutch, with the objective to learn Western military science, the young outsider balked. That it was frowned upon for a direct retainer of the shogun to study Dutch had little, if any, impact on Kaishu. He was innately inquisitive of things strange to him. He was also filled with a burgeoning self-confidence. But the idea of learning a foreign language seemed to him preposterous. He had never been exposed to foreign culture, except Chinese literature. It wasn’t until age eighteen that he first saw a map of the world. “I was wonderstruck,” he recalled decades later, adding that he had now determined to travel the globe. Kaishu’s wonderment was perfectly natural. His entire world still consisted of a small, isolated island nation. But his determination to travel abroad was strengthened by his discovery of strange script engraved on the barrel of a cannon in the compounds of Edo Castle. The cannon had been presented to Edo by the Netherlands, and Kaishu correctly surmised that the engraving was in Dutch. Thus far he had only heard about “those foreigners, the Dutch,” who lived in a small, confined community in the distant Nagasaki. “Those foreigners” had occasionally fluttered through his mind as mere phantasm, the stuff of youthful imagination. But now, for the first time, he saw in his mind’s eye, however vaguely, the people who had manufactured the cannon, and who had engraved in their own language the inscription upon its barrel. Those undecipherable letters of the alphabet, written horizontally rather than vertically, served as cold evidence of the actual existence of people who communicated in a language completely different from his own, but who until now had only existed as so much hearsay. Since these foreigners were human beings like himself, why shouldn’t he be able to learn their language? And once he had learned their language, he would be able to read their books, learn how to manufacture and operate their cannon and realize his aspiration to travel the world. In the face of Perry’s demands, the shogunate conducted a national survey, calling for solutions to the foreign threat. The shogunate received hundreds of responses, the majority of which, broadly speaking, represented either of two conflicting viewpoints. On one side were those who proposed opening the country to foreigners. Their opponents advocated preserving the centuries-old policy of exclusionism. But neither side offered a constructive means for realizing their proposals. In contrast, the memorial submitted by one unknown samurai was clear, brilliant, progressive, and included concrete advice for the future of Japan. In his memorial Kaishu pointed out that Perry had been able to enter Edo Bay unimpeded only because Japan did not have a navy to defend itself. He urged the shogunate (the central military power headed by the Tokugawa Samurai clan that had unified Jan under its power) to recruit men for a navy. He dared to propose that the military government break age-old tradition and go beyond birthright to recruit men of ability, rather than the sons of the social elite and certainly there was nobody in all of Edo more poignantly aware of this necessity than this impoverished, brilliant young man from the lower echelons of samurai society. Kaishu advised that the shogunate lift its ban on the construction of warships needed for national defense; that it manufacture Western-style cannon and rifles; that it reform the military according to modern Western standards, and establish military academies. Pointing out the great technological advances being achieved in Europe and the Untied States, Kaishu challenged the narrow-minded traditionalists who opposed the adoption of Western military technology and systems. Tokugawa retainers to study at the new Nagasaki Naval Academy, where he remained for two and a half years. In January 1860 Katsu Kaishu commanded the famed Kanrin Maru, a tiny triple-masted schooner, on the first authorized overseas voyage in the history of the Tokugawa Shogunate. Captain Katsu and Company were bound for San Francisco. They preceded the Japanese delegation dispatched to Washington aboard the U.S. steam frigate Powhatan to ratify Japan’s first commercial treaty. After the arrival of the Powhatan, they would return to Japan to report the safe arrival of the delegation. But more significantly for Captain Katsu and Company was the opportunity to demonstrate the maritime skills they had acquired under their Dutch instructors at Nagasaki, for, “as Kaishu emphasized,” the glory of the Japanese Navy. looked down upon the men of the merchant class, and considered business for monetary profit a base occupation. “Usually people walking through town do not wear swords, regardless of whether they are soldiers, merchants or government officials,” while in Japan it was a samurai’s strict obligation to be armed at all times. Kaishu also observed the peculiar relationship between men and women in American society. “A man accompanied by his wife will always hold her hand as he walks.” The immense cultural and social gaps notwithstanding, Kaishu, the outsider among his countrymen, was pleased with the Americans. 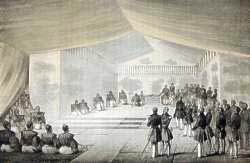 In 1862, Kaishu was appointed vice-commissioner of the Tokugawa Navy. He established his naval academy in Kobe in 1863, with the help of his right-hand man, Sakamoto Ryoma. The following year Kaishu was promoted to the post of navy commissioner, and received the honorary title Awa-no-Kami, Protector of the Province of Awa. In October 1864, Kaishu, who had thus far enjoyed the ear of the shogun, was recalled to Edo, dismissed from his post and placed under house arrest for harboring known enemies of the Tokugawa. His naval academy was closed down, and his generous stipend reduced to a bare minimum. In 1866 the shogun’s forces suffered a series of humiliating defeats at the hands of the revolutionary Choshu Army (one of the principle military domains). Kaishu was subsequently reinstated to his former post by Tokugawa Yoshinobu, Head of the House of Tokugawa, who in the following December would become the fifteenth and last Tokugawa Shogun. Lord Yoshinobu did not like Kaishu, just as Kaishu did not like Lord Yoshinobu. Kaishu was a maverick within the government, who had broken age-old tradition and even law by imparting his expertise to enemies of the shogunate; who openly criticized his less talented colleagues at Edo for their inability, if not blind refusal, to realize that the years, and perhaps even days, of Tokugawa rule were numbered; who in the Grand Hall at Edo Castle had braved punishment and even death by advising then-Shogun Tokugawa Iemochi to abdicate; and who was now recalled to service because Yoshinobu and his aides knew that Kaishu was the only man in all of Edo who wielded both the respect and trust of the revolutionaries. Kaishu was aware of the grave danger to his life as an emissary of the Tokugawa, but nevertheless traveled alone, without a single bodyguard. Shortly after successfully negotiating a peace with Choshu, the outsider resigned his post, due to irreconcilable differences with the powers that were, and returned to his home in Edo. In October 1867, Shogun Tokugawa Yoshinobu announced his abdication and the restoration of power to the emperor. But diehard oppositionists within the Tokugawa camp were determined to fight the forces of the new imperial government. The leaders of the new imperial government were equally determined to annihilate the remnants of the Tokugawa, to ensure that it would never rise again. Civil war broke out near Kyoto in January 1868. Although the imperial forces, led by Saigo Kichinosuke of Satsuma, were greatly outnumbered, they routed the army of the former shogun in just three days. The new government’s leaders now demanded that Yoshinobu commit ritual suicide, and set March 15 as the date fifty thousand imperial troops would lay siege to Edo Castle, and, in so doing, subject the entire city to the flames of war. The services of Katsu Kaishu were once again indispensable to the Tokugawa. Kaishu desperately wanted to avoid a civil war, which he feared would incite foreign aggression. But he was nevertheless bound by his duty as a direct retainer of the Tokugawa to serve in the best interest of his liege lord, Tokugawa Yoshinobu. In March 1868, with a formidable fleet of twelve warships at his disposal, this son of a petty samurai was the most powerful man in Edo. And as head of the Tokugawa army, he was determined to burn Edo Castle rather than relinquish it in battle, and to wage a bloody civil war against Saigo’s forces. When Kaishu was informed of the imperial government’s plans for imminent attack, he immediately sent a letter to Saigo. In this letter Kaishu wrote that the retainers of the Tokugawa were an inseparable part of the new Japanese nation. Instead of fighting with one another, those of the new government and the old must cooperate in order to deal with the very real threat of the foreign powers, whose legations in Japan anxiously watched the great revolution, which had consumed the Japanese nation for these past fifteen years. Saigo replied with a set of conditions, including the peaceful surrender of Edo Castle, which must be met if the House of Tokugawa was to be allowed to survive, Yoshinobu’s life spared, and war avoided. At an historic meeting with Saigo on March 14, one day before the planned attack, Kaishu accepted Saigo’s conditions, and went down in history as the man who not only saved the lives and property of Edo’s one million inhabitants, but also the entire Japanese nation. This article was posted with permission from the author. This article originally appeared in the Summer 2002 issue of Tokyo Journal. Permission to use the photo of Katsu Kaishu was provided by Takaaki Ishiguro, a photo collector currently living Tokyo. The image of Perry’s delegation presenting a Presidential letter to the Japanese authorities is from a collection of sepia toned stone lithograph plates from the original “Narrative Of An Expedition Of An American Squadron To The China Seas And Japan” provided complements of Kauai Fine Arts located in Lawai, Hawaii.